A major expansion of the Panama Canal is set to change the dynamics of global shipping and create a demand for East Coast and Southern ports with the capacity to handle giant container ships. It’s an opportunity that has fueled investments in dredging projects, new berths, terminals, massive cranes, and infrastructure to improve the connections between container ship off-loading and interstate highway on-ramps. 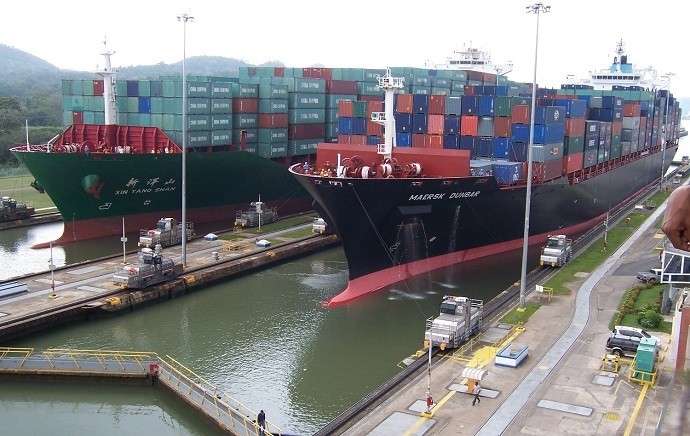 The $5.25 billion widening and deepening project — expected to be completed in 2016 — will allow “Post-Panamax” ships to transit the Panama Canal carrying up to 15,000 containers. That’s a threefold increase over the current limit. Those mega-ships will have an all-water access route to the East Coast from Asia rather than docking at West Coast ports and loading the goods on railcars. West Coast ports are feeling pressure to stay competitive in coming years, while East Coast and Southern ports are eager to meet the increased capacity demands created by Post-Panamax ships. In Florida, there is a proposal to spend $700 million on a 13-mile dredging project for the Jacksonville Port Authority (JAXPORT). “Deepening the port is to allow us to compete and handle the ships of the future that are going to be carrying the cargo to the East Coast ports,” said JAXPORT CEO Brian Taylor in an October 2015 interview with PBS. A channel deepening project is also planned for Port Everglades. Another project there would add five new Post-Panamax container cranes during the next 20 years. Further south, the Port of Miami has completed a new $900 million tunnel project to link port facilities with interstate highways in advance of the Panama Canal expansion. A new terminal at the Port of Charleston, South Carolina is expected to boost capacity by 50 percent after it opens in 2019. The Charleston Harbor Deepening Project received approval from the U.S. Army Corps of Engineers in September 2015. This project would deepen most of the shipping channel to 52 feet. According to a report from NAIOP, the project was “contemplated in direct relation to the expansion of the Panama Canal.” The Port of Virginia is already receiving Post-Panamax ships and means to stay competitive with investments in its VPA 2040 Master Plan. The strategy includes expanding terminal capacity, remaining flexible to new opportunities, and coordinating terminal access improvements with state transportation and economic development plans. The Port of Houston’s significant infrastructure has helped make it the leader in the U.S. for foreign waterborne freight. It has the capacity to accommodate increased traffic but may face challenges with increases to shipping volume in the broader Houston Ship Channel, according to NAIOP. The Port of Baltimore has prepared for the Panama Canal expansion by expanding its harbors, a berth, and cranes. The Port of New York and New Jersey has two billion-dollar projects in advance of the Panama Canal expansion: a major dredging effort and modifications to the world’s fifth-longest steel arch bridge. The Bayonne Bridge Navigational Clearance Program will raise the roadway 60 feet to allow large container ships to pass underneath. The expected completion date for navigational clearance is late 2017, according to the Port of New York and New Jersey. This entry was posted in Industry Insights and tagged canal, panama, panama canal, ports. Bookmark the permalink.